When you learn basic steps for applying makeup, you can easily advance to experimenting with different looks. Start with the right base of foundation and face makeup, then move on to enhancing your eyes and lips. There are many different types of foundation, so it's important to choose for both your skin tone and type. Before applying any type of foundation always start with a moisturizer so the skin stays well hydrated. Let the moisturizer dry completely before beginning the application process. For teens and those with fairly even skin tones, tinted moisturizer is a good option, providing light coverage and essential moisture at the same time. To apply, squeeze a small amount of product onto fingertips and smooth from the center of the face outward until it is blended into the hair and jaw line. Liquid foundation is one of the most popular types of face makeup because it offers great coverage for minor flaws and evens out the skin. However, most women feel as though it is also the most difficult foundation to apply. Follow these steps for a perfect application. Use a makeup sponge or clean fingers to dot foundation on your forehead, cheeks, chin and the tip of your nose. Blend the foundation into skin. While you blend, connect the foundation dots, being sure to include your hairline and jaw line. You shouldn't see a line where the foundation ends. Stand near a window to see if your foundation looks natural and that there are no visible streaks on your face. Other types of foundation include crème, cream to powder, and mineral makeup. Crème and cream to powder foundations should be applied using a round or cosmetic wedge. 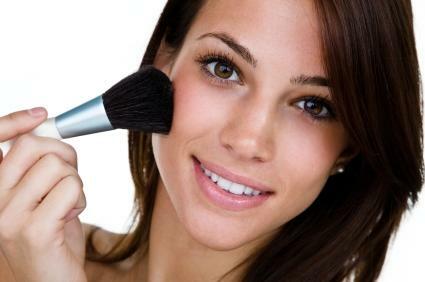 Mineral makeup comes in a powdered form and is applied with a foundation brush in a circular motion. With any foundation, however, the same principle applies -- start in the center of the face and blend outward to avoid a harsh makeup line at the jaw or hairline. Opinions differ as whether to apply concealer and coverup before or after foundation. You may want to try both methods to see what works best for you. Concealers come in stick, wand, and tube forms. 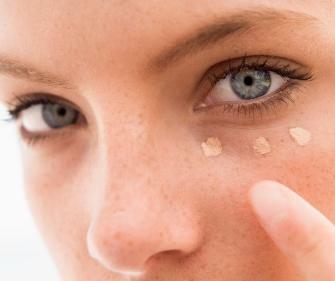 Getting full coverage from your concealer may take several steps. Gently dab a tiny amount of concealer onto any facial blemishes. This is the best method for concealing pimples or other blemishes or flaws. Let dry completely. Dab more concealer onto blemishes if needed. Gently dab a small amount of concealer to the under eye area if needed. Carefully smooth inward with your ring finger to avoid stress to the delicate eye tissue. Blush comes in powders, creams, and gels. Apply gel or crème blush with your fingertips or cosmetic sponge, and apply powder with a medium sized blush brush. The process of applying the blush, no matter what type it is, is the same. Look into the mirror and smile naturally. Apply blush lightly to the round part, commonly referred to as the 'apple', of your cheek, and then upward at an angle to define the cheekbone. Repeat the process, slowly building the color of blush on your cheeks until the desired color is reached. Learning to apply face powder is one of the easiest makeup steps. Loose powder should be applied after liquid foundations and blush to set the makeup. Dip a large makeup brush into loose powder. Gently tap the side of the container to tap off the excess powder. Gently dust the powder all over the face. Go back and re cover oily or shiny areas to keep the face looking fresh and polished. Pressed powder can be applied after foundation, or alone to set makeup or reduce shine. Most come in compact form with a pressed powder puff. Just press the powder gently and smooth onto the face. Eyes can be naturally highlighted on transformed for a dramatic look with eye makeup. Using eye shadow, eyeliner and mascara you can highlight your eyes and truly make them shine. Eye shadow comes in powders, creams, and other forms. Apply using an eye shadow brush or a sponge applicator for the best control. 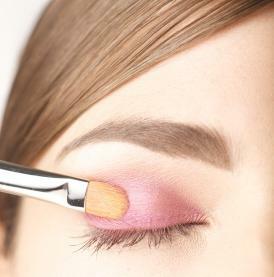 For a flawless eye shadow application, you can follow these steps. Apply a base coat of foundation or primer on your eyelids. Using an angled brush, sweep the lightest shade across the lid from lash line to brow. Apply a medium color to the lower part of the lid and blend well. Use the darkest shade on the lash line and outer corners of the eye. Use a small eye shadow brush to really work in the darker shade. To finish, apply a light highlighter shade to the brow bone. Online tutorials can help you determine the right makeup for your eye shape and step by step guides on how to create gorgeous smoky eyes and other different eye makeup techniques. There are a variety of eyeliner types, including pencil, liquid, gel, pen and crayon; each has advantages and disadvantages. Experimenting with different types will help you find a favorite. Once you settle on an eyeliner, consider the following tips for proper application. Hold your eyelid with one hand and the eyeliner with the other hand. With a steady hand, start at the outer corner of the eye and work your way in the center of the eyelid. Use short, feathery strokes, rather than drawing one continuous line. Smudge the eyeliner with a smudging tool, cotton swab, or an eye shadow brush dipped in your favorite shadow for a smoky, smudged look. To really draw attention to your eyes, apply the liner out slightly past the outer corner of the eye and sweep upward with a slight turn. This is one of the many ways to create unique eyeliner styles to achieve different makeup looks. Mascara really finishes off the eyes, and can even look tremendous without any additional eye makeup as well. Applying mascara can be easily done in a few steps. Start by curling your lashes with an eyelash curler if desired. Take your mascara and hold the wand vertically and move upwards from the base of the top lashes. Let dry. Comb through lashes with and eyelash comb. Apply a second coat of mascara. 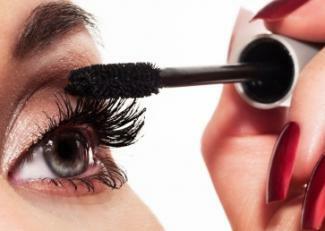 Apply mascara to lower lashes by holding the wand vertically. Move across the lashes to give greater definition. Lips can be finished off with a simple sweep of gloss, For lasting color, line your moisturized lips along the natural lip line and fill in with a coordinating color of lipstick. Dot lip balm on your upper and lower lip to give you an even palette. Use a lip pencil to outline your lips. Choose your favorite lipstick and apply it starting at the center of the upper lip and moving outward toward one corner. Return to the center of the upper lip and run it outward toward the other corner. Repeat with the lower lip. Take a tissue and blot your lips to keep the lipstick off your teeth. If you prefer gloss and want a a fuller-lip look, apply a dab of light-colored lip gloss in the center of the bottom lip and blend into the lip color. Although tube lipsticks are quick and easy, using a lipstick brush offers you greater control and coverage options. To use a lipstick brush, place a small amount of color on the rush and apply in small motions for the coverage you want. After learning the necessary steps for applying your makeup, you will want to practice to make sure you have the techniques down. Stand in front of a mirror with the necessary tools and a bottle of makeup remover until you are a pro at flawlessly applying your makeup.